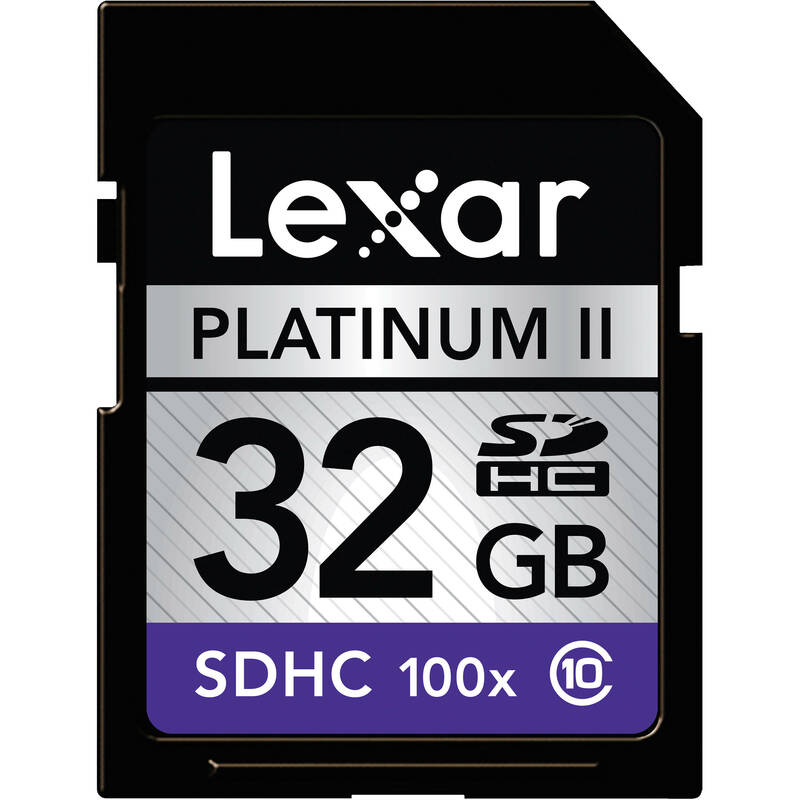 The Lexar 32GB SDHC Memory Card Platinum II Class 10 is a high-capacity card designed for fast-action shooting. Rated at Class 10 and featuring a transfer speed of 100x for 30MB/s maximum read speeds and 10MB/s minimum write speeds, the Platinum II card keeps up with your camera's burst mode or other high-speed capture functions. This allows you to take a large number of photos in succession. 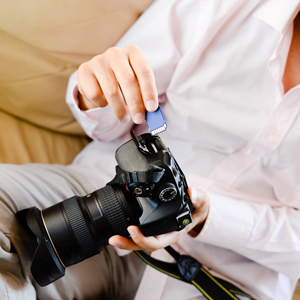 When you're ready to transfer the data to your computer, the card enables quick uploads as well. In addition to aiding in your digital photography endeavors, this card is also idea as memory expansion for your netbook computer, letting you store numerous HD movies without taking up your laptop's precious hard drive space. Box Dimensions (LxWxH) 7.0 x 5.0 x 0.05"
32GB SDHC Memory Card Platinum II Class 10 is rated 4.8 out of 5 by 136. Rated 5 out of 5 by John-117 Master Chief from Do not Repeat my costly mistake After months of research I found the Cannon HF S20 fit my needs. It was not cheap. I decided to save $ by buying two 32GB SD cards on cheap on a bidding web site. Plan seemed good untill cards failed and I cried as I lost family wedding pictures due to card failure. I strongly suggest you invest in good cards just as you invest in a good camera! I have not had these card long but they seem to work much better than my so called bargain. So far so good. Please learn from my terrible mistake. Rated 5 out of 5 by Tog from More than adequate for the job I bought it for use in a video recorder - the capacity is big enough to forget about it for the day, and the write speed is more than adequate for the VGA resolution video I am recording. I would probably go for something faster if recording high-rez video or shooting RAW in bursts with a high-FPS camera. I don't think I'm likely to have this card be the bottleneck in my 60D. I haven't had any reliability issues; I've only had the card for a few days, so it is too early to tell, strictly speaking. However, from my past experience with Lexar (and Sandisc), I would not expect any. Rated 5 out of 5 by John from Superior, Fast Memory Card I'm using this memory card in a Canon Rebel EOS T1i 500D camera. It allows me to take as many pictures as I want (over 4700) but more importantly it allows me to shoot about 2 1/2 hours of video at 720p (about 100 minutes at 1080p). Without getting too caught up in the numbers, this cvard allows me great flexibility in shooting both still pictures and video. The quality of all my shots is great and the c ard is fast. I can't think of any cons about this memory card. The price B&H charged me was also great-it was on sale. What could be better? Rated 5 out of 5 by Guitar Picker from Fantastic product! Great Value! I have been very pleased with the Lexar 32GB Platinum II SDCH Memory Card. I am using this in a JVC digital camera, with great results. Being a Class 10 device, it is very fast. Rated 5 out of 5 by Michael from Affordable & Functional I use these in a Canon T3i and a GoPro HERO 2 to shoot video & timelapses--totally functional, plus no problems recognizing them in my external card reader, my iMac's built in card reader, or either camera. Cheaper than bigger brands, seem to work just the same. Might be issues on higher-shelf gear, but not @ write speeds my equipment requires. Rated 5 out of 5 by virgilio v. from Still not fast enough for 60fps My canon 60d and t2i camera will show, camera stopped automatically within 5 seconds when trying to record a video in 720p 60fps. But when I try it again, it will somehow work again. I have two of these with the same exact problem. I checked the specs and it may still not be good for 60fps, I'm sure it's ok with 1080p 24fps or 30fps. Rated 5 out of 5 by Water Wahine from Good card, Good value I bought this card for my GoPro HD Hero2 because I wanted lots of storage space, and it's been fantastic. No read/write issues, perfect recording... the Hero2 gets over 5000 still images at 11MP resolution and over 4 hours of HD video at 960-30. Rated 5 out of 5 by Jpichicago from B&H Keeps Me Coming Back for More This is the 3rd or 4th time I've ordered SDHC memory cards and assorted camera accessories. Every order has been correct and in good condition, and shipping has always been quicker than advertised. Thank you, B&H!